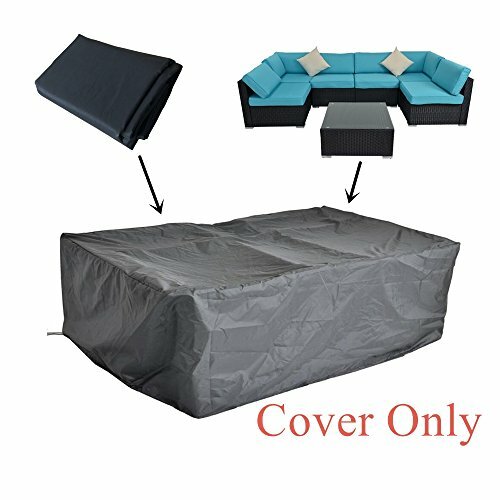 7PCS outdoor furniture rain cover for protecting your patio furniture.It is suitable for All-Weather. -It is only furniturn cover,not fruniture,it is suitabable to most furntiure, but please still measure the size of your furniture set carefully. -Size:111 X 56.6 X 25.5 inches. -After folding, the volume is small and does not take up your space. -190D Oxford cloth and Durable Water Resistant waterproof fabric for long time use. -Adhere to Amazon Return Policy.If you have any problem,please feel free to contact us at first. If you have any questions about this product by JETIME, contact us by completing and submitting the form below. If you are looking for a specif part number, please include it with your message.